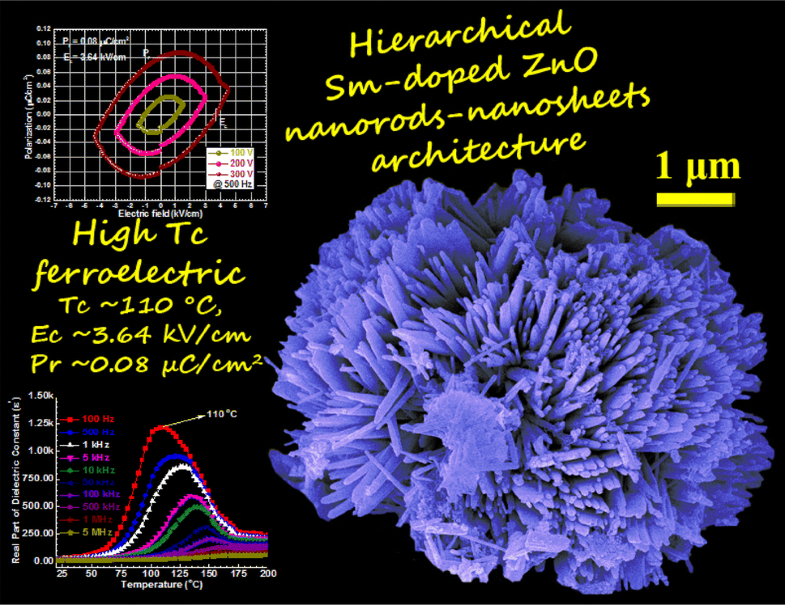 A novel hierarchical samarium (Sm)-doped ZnO nanorod–nanosheet architecture with high-temperature ferroelectricity (Tc ~ 110 °C, Ec ~ 3.64 kV/cm and Pr ~ 0.08 μC/cm2) have been developed here using wet chemical co-precipitation method. In this study, we show the origin of ferroelectric behavior in Sm-doped ZnO product and study the effect of frequency and temperature on its dielectric characteristics. Interestingly as an impact of Sm-doping, the morphology of pristine ZnO got evolved from 1D nanopencils (NPCs) to 3D hierarchical architectures composed of both 1D nanorods (NRs) and 2D nanosheets (NSs). Crystallite size (L), lattice strain (ε), deformation stress (σ), and uniform energy density (u) of both isolated 1D NPCs and 3D hierarchical NR–NS architectures were evaluated using the Debye–Scherrer and Williamson–Hall methods. Temperature-dependent real dielectric constant (ε′) revealed a ferro- to para-electric transition peak at 110 °C. Temperature-dependent complex dielectric constant (ε″), dielectric loss (tan δ) and ac conductivity (σ) were found to increase with temperature. The frequency-dependent dispersion curves of dielectric properties showed an increase in ac conductivity with increase in frequency whereas complex part of dielectric constant and dielectric loss showed an opposite trend. The Sm-doped ZnO NR–NS architecture exhibits weak ferroelectricity with a coercive field (Ec) of 3.64 kV/cm and a remnant polarization (Pr) of 0.08 μC/cm2 at room temperature. Moreover, the high-temperature ferroelectricity established in this work will make Sm–ZnO a futuristic material in the field of designing memory devices. The authors want to thank Armament Research Board, ARMREB, Defence Research and Development Organization (Sanction No. 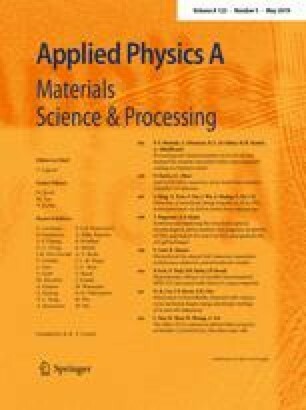 : ARMREB/MAA/2015/163), India, and the Department of Science and Technology (Sanction No. : EMR/2015/000385), India for financial support while carrying out of the work. S.G. is grateful to CSIR for Senior Research Fellowship.